►Support 3030/3042 M.2 Card dimension. ►Support M.2 Socket 1 Module. ►Support M.2 Key A/A-E Card Type. 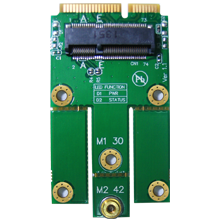 ►Allows user to use M.2 Socket 1 Module to mPCIe Slot in the Desktop or Laptop. 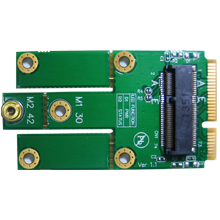 ►Supports system bus interface: PCIe&USB2.0. ►Supports USB interface of Mini-Cards such as 3G,CDMA, WWAN, HSPA, GPS, WiMAX, Bluetooth Mini Card to desktop PC.